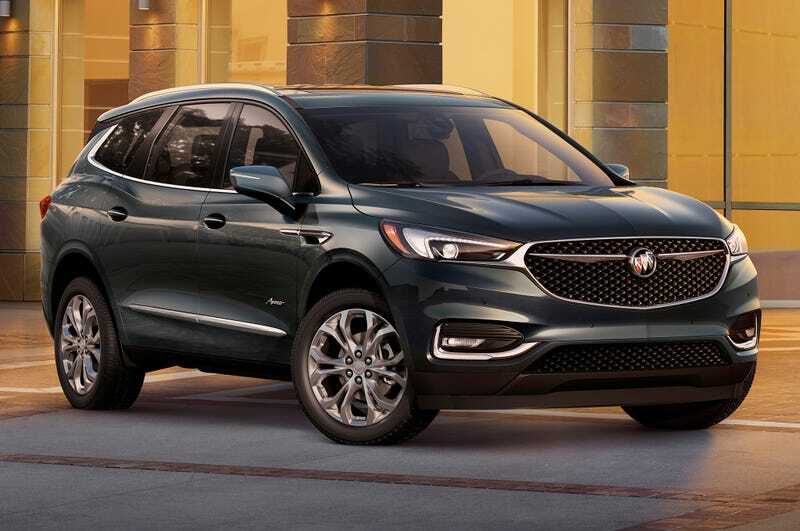 2018 Buick Enclave: Jalopnik seems to have missed it. I thought I would post this here since Jalopnik seems to have missed it. Espcially with the Buick following thats on here. After over 10 years with just a refresh, the Enclave finally got redesigned for 2018. I found it weird GM waited so long to redesign it considering that it was the first of the Lambda platform quadruplets (Saturn Outlook,Chevy Traverse,GMC Acadia,Buick Enclave). The introduction of the Enclave also introduces the Aveinr luxury trim. Its been totally redesigned and I think looks more handsome and inline with the current lineup. For 2018 it gets a slightly longer wheelbase and lower roof line, but retains its Enclave-ness(?) that should be recognizable to people familiar with it. All models come standard with seating for 7, heated and ventilated front seats, heated second-row seats, an 8.0-inch reconfigurable cluster display, navigation, wireless charging, a dual moon roof, a power-folding third-row, and a 360-degree camera system. Impressive considering the competition. All trims also come with GM’s familiar 3.6 V6 rated at 302 hp and mated to a 9 speed auto. Front drive is standard with AWD optional. The big news for 2018 is the new Avenir trim, which is sort of like Buick’s Denali, adding more luxury touches. Enclave Avenir’s add exclusive features like a Buick-first Evonik Acrylite exterior forward lighting composed of more than 100 LEDs , available Avenir Chestnut and Ebony interior with seat piping, contrast stitching, and embroidered front headrests, a wood-accented steering wheel, Avenir floormats, and Avenir script sill plates on the front and rear doors. Other models in the Buick lineup are going to get the Avenir treatment although I didnt see them say when and what models, though I would assume they start with the new Regal. Honestly though I wasn’t impressed with the Avenir trim. When it was first announced I thought it was going to be some kind of lite personalization program along the lines of Lincolns Black Label. But its just a Denali like trim like I mentioned before. I think the Enclave is a step in the right direction for Buick, especially design wise, although I feel the interior dash design mirrors the Envison too closely. And with this being their top dog crossover, they could have done better. But head on over to Buick to check it out for yourself. What do you guys think of it?